Handicap cooking aids can provide help for people with disabilities while cooking, serving meals or eating. A well-designed handicap cooking aid is often what is needed to allow a person to fix meals by themselves. 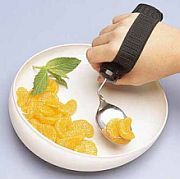 In addition, handicap eating aids allow the person to feed themselves. They can be a wonderful help to provide individuals with more freedom and regain their independence as they work in the kitchen. Listed below are a list of recommended to buy handicap cooking and eating aids. Let us look at some of the adaptive cooking equipment that is available for those in need of assistance. Plates and bowls are designed with built in side guards or food bumpers, which prevent food from slipping off the plate. A suction base underneath the plates keeps the food stable. Simple clothing food protectors or adult bibs can save a lot of money in the long run. Bibs are waterproof but can be washed and reused even with stains. Save yourself from hot liquid spills and scalding. These adult bibs can cover the whole chest and lap. Specially designed roller knives make for easier cutting. Place the knife in between your fingers and use a gentle rocking motion. These U- shaped rocking knives have sharp blades so it does not take much to slice and dice. Handicap reachers can help people to reach items that are too far for them to get to easily, such as a glass or a cup. Mirrors can be hung over cooking pots on the stove allowing people from a sitting position to see the contents of food cooking in pans. Special pan holders prevent pans from sliding while cooking. One-handed dish scrubbers can be attached with suction to the bottom or side of a sink. 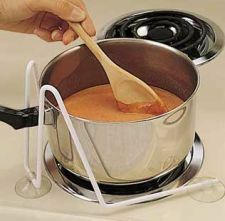 This stabilizes a dish or pan for easier washing. Two other important handicap cooking aids include one handed cutting boards and easy grip utensils . There are several types of disabled cutting boards, some of which clamp on counter tops, while others are designed with sides to prevent food from slipping off. Many one handed cutting boards are designed with pins that clamp and hold the food while cutting. Prices vary from about $35 to $80. 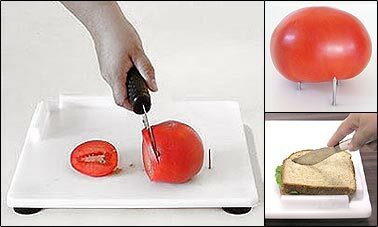 Single Handed Cutting Boards – Use the embedded spikes to hold fruits and vegetables in place while making slices. Put bread near the raised edges and cut your sandwiches in half. 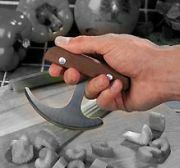 Adaptive Knife with Cutting Block – these handicap cutting boards comes with a curved surface so food getting chopped does not fly off the board. One Handed Cutting Boards – comes with spikes and a vise to hold the food in place. One Handed Spreading Boards – these boards are great for keeping the bread in place when spreading peanut butter, jam or other food spreads. 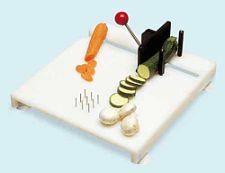 Food Preparing And Cutting Station – This is a large sized fully equipped cutting board with a grater, slicer, clamps to hold jars/food, spikes to keep food in place while cutting or chopping, and nonslip pads underneath to keep the board in place. Easy grip utensils such as silverware and spatulas provide special handles that are easier to hold onto or strap onto and allow people to be self-sufficient while eating or preparing food. Handicap eating utensils require less hand dexterity and strength from the user. Individual silverware for the handicapped such as the plate guard pieces can cost about $9 apiece depending whether they are purchased as a set. Most types of handicap cooking aids used in the kitchen require little if any maintenance and are quite helpful to people that require a little assistance. Get weighted forks, knifes and spoons to help steady and decrease hand tremors. These weighted handicap forks has an average weight of 7.2 to 7.5 ounces. Some of these handicap cooking equipment can be great gifts for a loved one. They are amazingly functional as handicap kitchen aids and will help bring independent cooking and eating into their lives.